If Denver is known for one dish, its green chile. The undisputed champion serving knockout punch after knockout punch to all other foods that step into its plate-shaped ring. 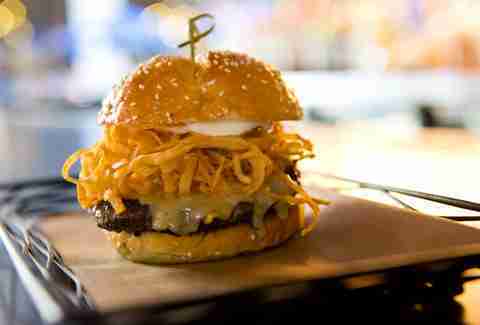 But there IS another food that’s making a serious comeback in the Mile High: The burger. 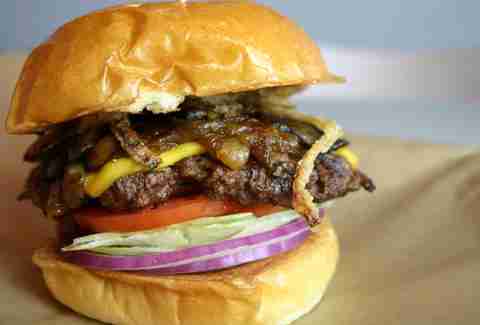 Although it remains relatively under the radar, Denver’s burgers could compete with any other city’s, easily. From one topped with peanut butter to another loaded with bacon, poblano peppers, and goat cheese... here are the best burgers you’ll find in Denver, right now. The SB embraces quirkiness. Case in point, it does bingo brunches and serves cocktails dedicated to recently deceased celebrities. However, the burger is no joke. 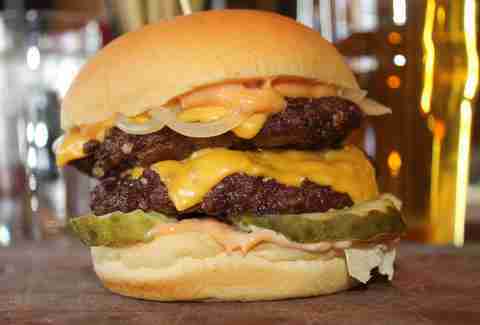 It’s a straightforward ode to that favorite from the golden arches with two patties swathed in melted American cheese, and served on a soft bun with pickles, grilled onions, and the requisite special sauce. Get some thin, crisp fries on the side, and a beer (or soda), and you’ve got a grown-up version of your favorite fast-food meal. Ever had a bacon-wrapped date? If you have, you know that it’s basically a perfect bite: salty bacon, sweet date, creamy goat cheese… now put that on a burger, add roasted poblano for even more flavor, and there’s no need to wait for an actual date night to try this sucker. In fact, it’s better if you don’t have to share. Just don’t forget to stop by the ATM first; this place is cash-only. Forget ketchup, pass the peanut butter. Sure, it’s a little odd, but once you taste this burger topped with pepper Jack, thick, sugar-cured bacon, and creamy peanut butter, you’ll wonder why more places haven’t caught on to PB’s obviously magical relationship with juicy patty-style beef. It’s no secret that Denver loves green chili, as evidenced by this Mexican “hamburger” served in a tortilla, then smothered in green chili and a mound of decidedly un-fancy orange-hued cheese. Though you can find it on the menu at many Mexican restaurants in town, the version at longtime diner-style favorite Sam’s No. 3 comes topped with some of the best pork green chili in town. We’ve all been there. A classic cheeseburger sounds pretty great, but so does one with sharp Vermont white cheddar, fried onion straws, and creamy horseradish sauce, or maybe… ugh, it’s so hard to pick! Well, thanks to this dinner-only option at 5280, you don’t have to: instead you can get any two burgers on the menu in the form of juicy, jumbo-sized sliders. 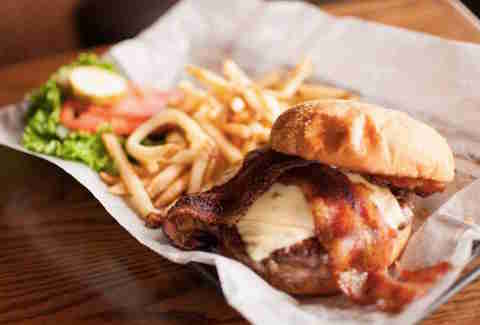 At this otherwise nondescript neighborhood pub, the burger packs a triple-punch of meatiness via a braised short rib and ground chuck patty served with bacon on top. And if that’s not tempting enough, things get messy (in a good way) with the addition of cheddar cheese, and a heap of rich béarnaise. The Cricket’s been serving up food in Denver for 70 years, so it’s pretty clear that this 1950s trucker bar-turned-burger joint is doing something right. 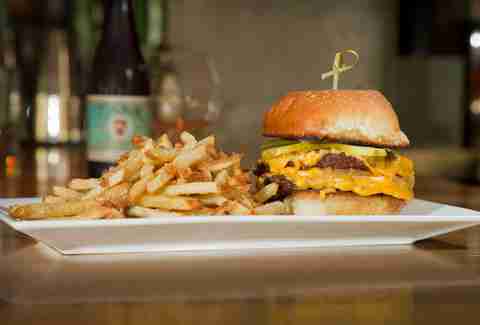 It starts with the basics: a half-pound patty on a sesame seed bun. Then you take over, picking from the extensive list of additions. At this point, this place has seen it all, so if herb cream cheese, grilled pineapple, and corned beef are what you’re craving -- go for it. The Meadowlark is a well-known local music venue, and now its burger is getting a rep too: it’s tall, messy, and unapologetically indulgent, with a mountain of cheddar cheese sauce, candied bacon, an onion ring, jalapeño confit, and a poached egg all piled on a brioche bun. But don’t worry, the toppings aren’t making up for a shoddy patty -- the beef is from local butcher shop Western Daughters, making this burger far more than just some towering curiosity. This weekday lunchtime pop-up inside Old Major serves up some of the best fried chicken sandwiches in town, so when it added burgers to the lineup, it had a lot to live up to. But burger dreams really do come true with this double-pattied beauty topped with melted American cheese, onions, lettuce, and tomato, and served on the irresistible and aptly named "squishy bun." At this under-the-radar spot, you can get almost anything on your burger -- fried pickles, banh mi slaw, mortadella -- it's all fair game. But it's the appearance of this Minnesota classic, stuffed with a heap of melty cheese in the middle of the patty, that's really making us swoon. Denver's south suburbs get a bad rap for their supposed lack of new food options, but if that's what you think, you haven't looked hard enough. Otherwise you would have found Juicy Burgers & Dogs, a joint that's perfected affordable, greasy, char-grilled meat patties. This version, topped with strips of roasted green chiles, pepper jack cheese, mushrooms, crispy onion strings, and chipotle aioli, is a creation that should not be missed. As a bonus, you can score a free ice cream cone after downing your meal. House-made pimento cheese set atop a juicy patty should be enough reason for you to head to this neighborhood favorite, right? 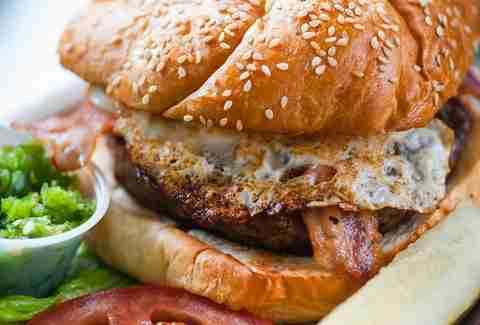 Well, what if we told you bacon jam was invited to the burger party, too? It is. 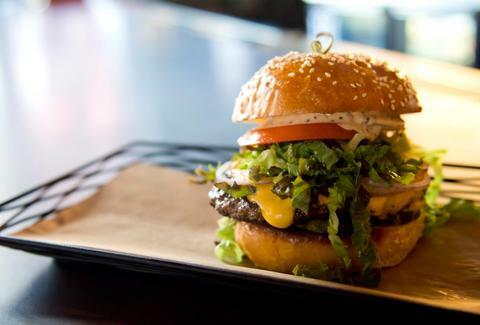 After you try this irresistible indulgence, head here on Tuesdays, when you'll find a different experimental burger making a one-night-only appearance weekly. Molly Martin is a Denver-based freelance writer who will totally eat your pickles if you don’t want them. Or just steal ‘em. Follow her @mollydbu on Instagram and Twitter.